Home >> Ring Kits >> 475pc Internal Stainless Steel Retaining Ring Kit. Made in The USA. 475pc Internal Stainless Steel Retaining Ring Kit. Made in The USA. 475pc Internal Stainless Steel Retaining Ring Assortment. 18 Diffrent Sizes. Retaining rings are packaged in a heavy duty translucent box with an identification card inside. Material: Stainless Steel. System of Measurement: Inch. Made in USA! 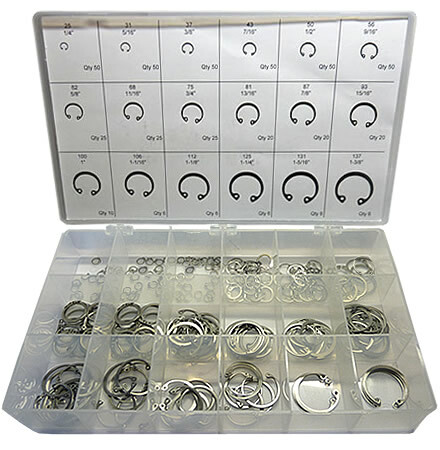 475pc Internal Stainless Steel Retaining Ring Assortment.